The mind games commenced on day 3 of 2010 Stena Match Cup Sweden as the quarter finals started with a first to three points scenario, taking care of semi finals runner and riders selection for Stage 5 of the ISAF World Match Racing Tour. All eight teams had a tight rope to walk today balancing out joint commitments to both match racing boat positioning and on course strategy looking for the pressure in between shadowed pools near the two headlands. Out of harm’s way and into the semi finals are only 4 remaining helms. Ben Ainslie and his TeamOrigin crew was first to go through ahead of Mathieu Richard on a clean score sheet today at 3-0, Torvar Mirsky was the second bright eyed skipper back to the dock going through to the semis beating Damien Iehl on 3-1. Magnus Holmberg has put the whole of Sweden on a high coming in with 3-1 over Ian Williams and his Team GAC Pindar and after tight tactics Jesper Radich took out Azzurra skipper Francesco Bruni 3-2. There were a number of defining moments today during the quarter flights. For Ainslie’s third and final match of the day against the 2010 WMRT’s current overall leader, Mathieu Richard, the triple gold medalist went for a clean start as spectators witnessed Richard opting to focus on trying to pin a penalty on Ainslie. This was big mistake for Richard as he took his mind off the bigger picture and disrupted his boat speed momentum for the first beat so essential in these lighter airs. Ainslie never looked back motoring off into clean air and a comfortable lead. 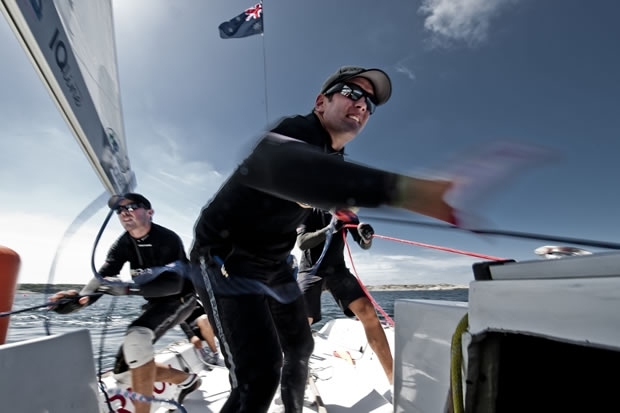 Ainslie explained why he concentrated on boat speed for the start in match three: “The first two starts we had struggled pushing back to the line as it was a bit lighter and there was current against us coming back to the line and so the last start we led back. We were in a really strong position although we had a pretty close incident when Mathieu tacked and luffed us and we didn’t really have any room to keep clear but we managed to and it was a green flag which was really good for us as he was then late giving us a nice start”. Mirsky and Iehl at the younger end of the Tour’s spectrum mixed things up today producing welcomed action afloat. Iehl has been dubbed ‘the black sheep of the French flock’ preferring to shake things up in boat on boat battles. Mirsky however, was a slave to time on distance today taking beautifully timed runs to the start line bang on time. During one maneuver Mirsky opted in fact to drop his genoa to preserve his forward momentum and expertly activating a soft slam dunk over his opponent. The Mirsky Racing Team sailed smoothly and calmly today with his whole team in perfect harmony and their weight exactly in the right places at the right time. During the play with the genoa, the sail was hoisted again when the boat was at the ultimate angle to catch the wind and the whole crew kept pulse rates low in the moderate airs. “It was a big moment for us, Damien and ourselves were at 1-1 going into our 3rd race, he crossed ahead of us on the beat up to the windward mark and we knew the right was quite strong near the rocks and he wanted to protect it so he crossed on starboard, then tacked on top on port and we luffed up on port and in that situation it’s who can coast to windward the best so we dropped our genoa really quickly and we were all patting our pitman on the back because Damien also dropped it straight away and we coasted up inside and were able to hold there and protect the right side. We ruffled Damien’s feathers as he got really upset with his crew and the umpires”. Bruni and Radich proved the ultimate viewing experience today with a set of cat and mouse matches. Both helms tried desperately to upset each other’s rhythms, with Radich introducing some unorthodox moves even attempting reverse circling during the pre-start of match 3. Bruni held on throughout the uncharacteristic set of radical moves and led into the start text book style only to be hit with a penalty from the umpires that he needed to offload, a very negative feeling followed. Radich made a big impact at the last Tour event he competed in this year after a successful 2nd place at Match Race Germany. His past has been training in this style of boat but this was 6 years ago now, “I think we take some advantage in having some past in the boats but the most important things is we are still learning and we learnt a lot today, I wasn’t even planning on doing match racing this year but I am really enjoying racing on the Tour and want to do more next year”. Holmberg shot from the hip today also with a strong emphasis placed on time and distance. The Tour’s style of racing really brings out the natural talent in these more experienced helms. There are no technical advantages available on the race boats as witnessed in the America’s Cup, the skippers must instead use their core skills. Holmberg perfected this traditional approach today delighting the Swedes lining the castle’s parapets, all cheering as he commanded the left hand side of the race course and not even becoming flustered when Iehl in a different match to him affected his wind on the track. “Before we started we said we felt the left was strong so that’s where we wanted to go and it seemed like the right call but then again it can change quick”. Holmberg has made the semis here now 11 times out of 16, but he modestly credited his crew today with his victories and looked forward to more Marstrand racing. Support on the shore is winding up for finals day in the women’s division tomorrow with Lucy Macgergor (GBR), Katie Pellew (AUS), Ekaterina Skudina (RUS) and Renee Groeneveld (FRA) fighting it out in the semi finals. Followed by the World Match Racing Tour’s men’s finals and half way point of 2010’s Tour calendar on Sunday.